The basic idea behind Xiangqi is that two armies are facing each other with the intent of capturing the other side’s general. If this sounds familiar, it should, that could easily be the description for our western chess. 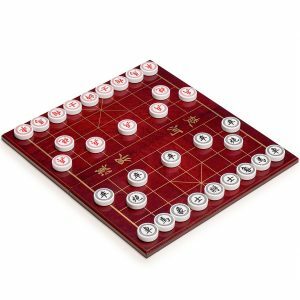 The board for Chinese chess comes in a variety of sizes ranging from small travel boards, to large outside playing boards. The average seems to be roughly between 13″ and 20″. Although they may appear square, they usually are not but are slightly longer (from player to player) than it is wide. Instead of placing the pieces on the board inside the squares, in Xiangqi the pieces are placed on the intersections of the lines like in Go. These boards are nine lines wide by ten lines long making it a rectangle of lines. Boards sometimes have odd size borders to makes them square. Looking at the board from the point of view of a player you will notice that the area in the center of the board closest to the player is an area that has not only the same vertical and horizontal lines as most of the rest of the board, but also diagonal lines. This area is called the castle. Between the two sides is an area different from the rest of the board and this area is called the river. There are two pieces affected by the river; soldiers who gain enhanced movement after crossing the river, and elephants who can not cross at all. Each side has a color, usually red and black. Red typically goes first however this has varied through time and rules set used. 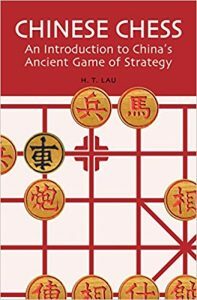 A great way to learn this game is through the book Chinese Chess: An Introduction to China’s Ancient Game of Strategy by H. T. Lau. Suitable for both adults and young adults, this book is available in hardcover, paperback and Kindle editions. While having the book is an excellent place to start, particularly since you can take it anywhere and brush up on the basics, sometimes you need a little more. There is a great website called XqinEnglish which can speed you on your way to learning. The website includes a ton of information including games, videos, manuals, and much more. To make it even better, it is all free!